We are back! And I have so much to say about the Carnival Sunshine!! I didn’t know how the kids would respond to 8 days at sea, but we OWNED IT party people. We owned it. In fact, the kids were really bummed when our vacation was over. Throughout the cruise, Bill and I kept joking with the newlyweds that we were having a MUCH DIFFERENT cruise than they were. We longingly watched them rest quietly under the sun while drinking their frozen concoctions. Us? Not so much. 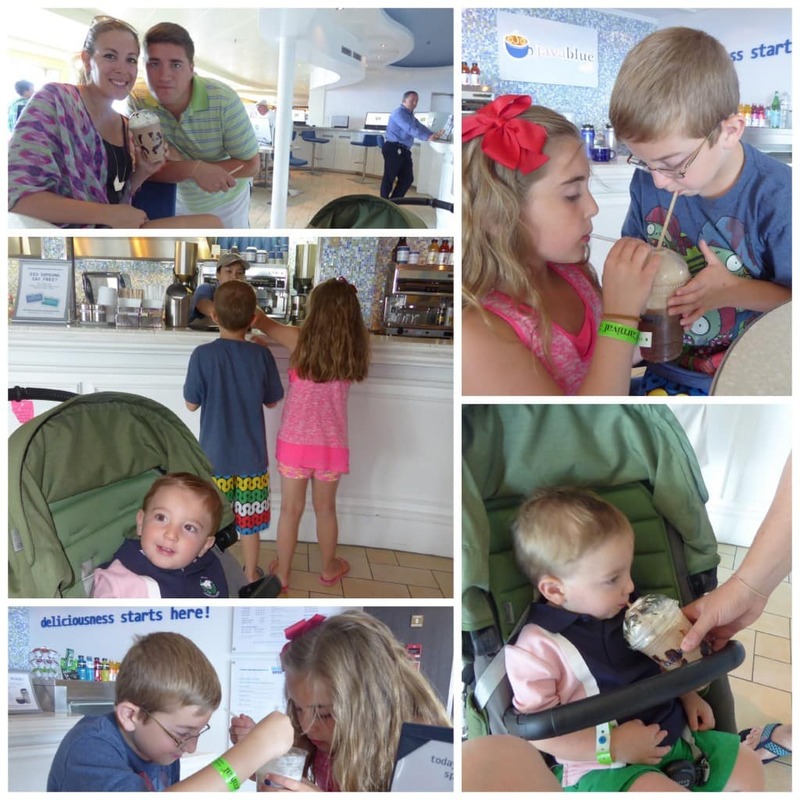 We celebrated the family version of the Carnival Sunshine and honestly – we had a blast too! I sat down with the kids at the airport and asked them what their FAVORITE spots were on the Carnival Sunshine cruise. We talked it through and came up with 9 activities that we thought you should put on your radar. Are you planning on taking a Carnival cruise? Then be sure to add these to your itinerary. Are you kidding me? These slides are on board the SHIP? You mean we have access to a water park for the entire cruise? Ah-mazing. The kids LIVED HERE and I mean it. The slides had a height requirement – 42 inches – just an FYI. Right next to the slides is a mini-slide area for all children. Natalie and Liam swapped back and forth between these two areas. It was so much fun! I am telling you!! We ended up enjoying the Shake Spot twice while on the Carnival Sunshine and BOY was it GOOOOOOODDDDDD. The Shake Spot is not included under your all-inclusive umbrella. You do have to pay extra for these drinks. So, we split one each time. They are thick and rich and absolutely filling…. OH and WORTH IT. Deck 5 mid-ship. If you want, there is a free card you can get that will enable you to score a FREE shake after purchasing 6. We didn’t hit that number, but maybe you will???? Yes, there is an arcade on board! You just use your room key to activate the games. There are claw machines, ticket earners and straight up arcade games. I didn’t allow my children to have charging privileges on their cards, but it is an option on board. 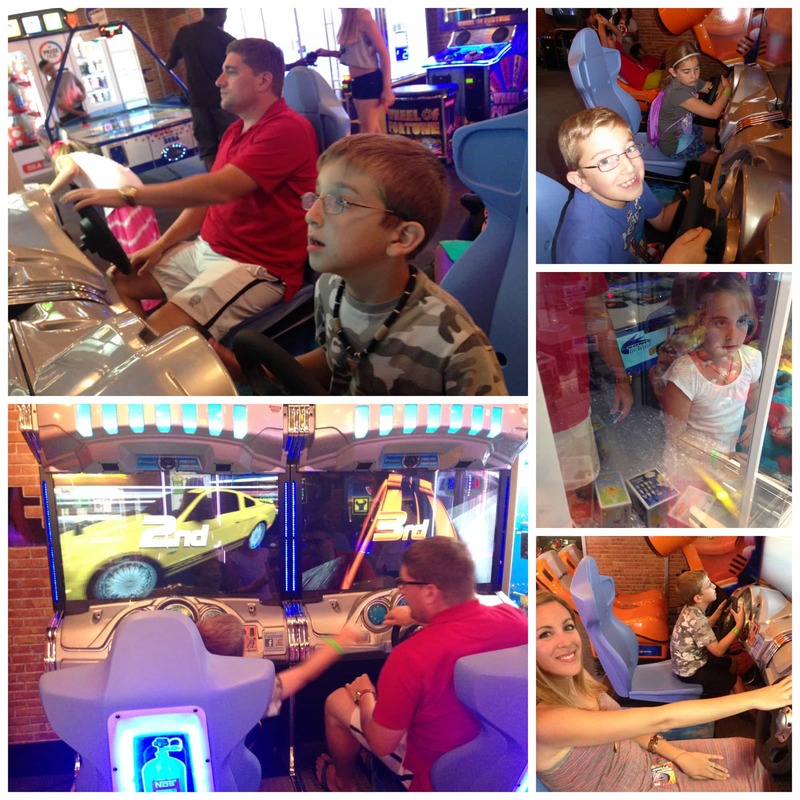 We visited the arcade a few times during our trip – usually after dinner. Now – I’m going to be honest here. This was a very quick GAME. It is ONE ROUND and that really surprised me but the kids enjoyed it and wanted to put it on the list. So here we are! We used the pop-out cards which meant that no markers were involved. Thank goodness. We LOST — otherwise this section would have been all in caps. LOL! 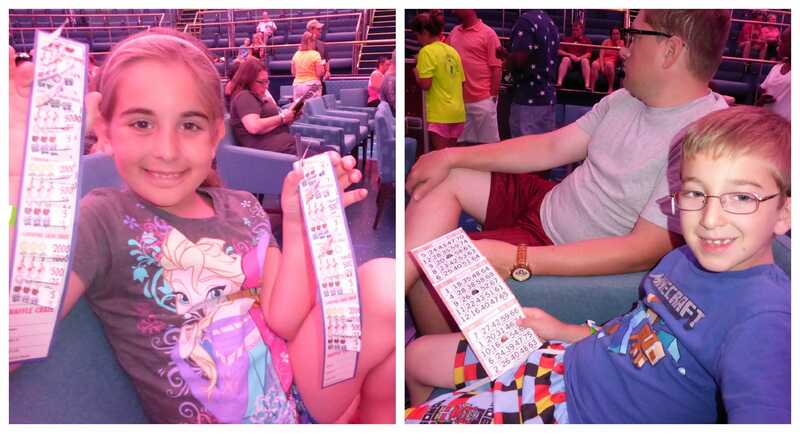 If you are a Bingo loving family, just know there are options on board. WHAT?! This was the absolute best part of the boat for families if you ask me!! Moms and Dads pack your sneakers because you need closed toed shoes to get up on this Sky Course. I couldn’t DO IT BECAUSE I ONLY HAD HEELS AND FLIP FLOPS. NOOOOOOOO!!!!! They should RENT SNEAKERS FOR PEOPLE LIKE ME! UGH. Anyway, my kids and husband all got to go around a few times and flipping LOVED it. I swear I was so jealous. It looked so FUN. Pooh! Pooh! Pooh! Yes – I’m being a child about it…. 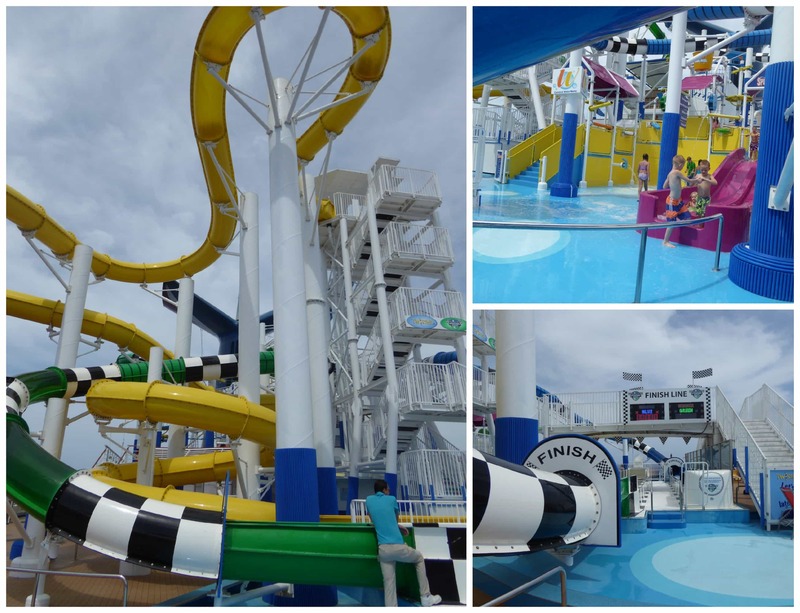 The Carnival Sunshine Sky Course is a MUST DO. You have to check your daily schedules for this one. It only happened ONCE during our trip. 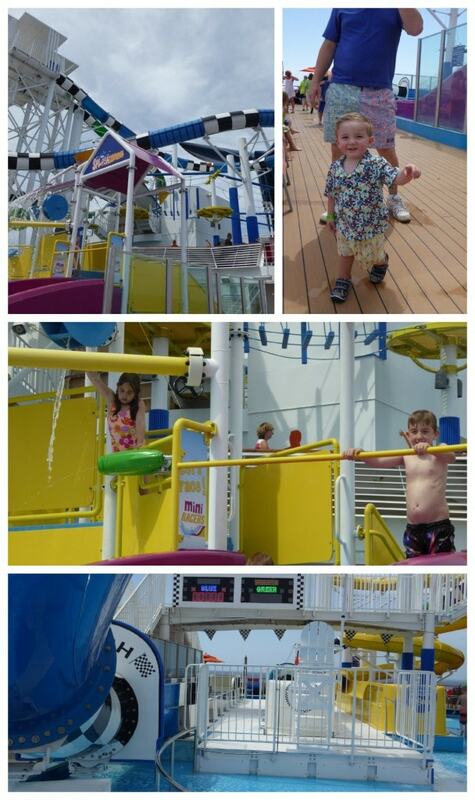 The kids all got together on deck 5 and grabbed a bunch of noisemakers and then had a HUGE parade around the ship. Parents held signs featuring various Dr. Seuss characters and everyone chanted along. It was so cute. The little ones especially got a kick out of it all. The parade ended by the stage where all the kids gathered ’round to hear the cruise director read ‘The Cat in the Hat’ while watching a reenactment by the cast and select parents. Shut it down. 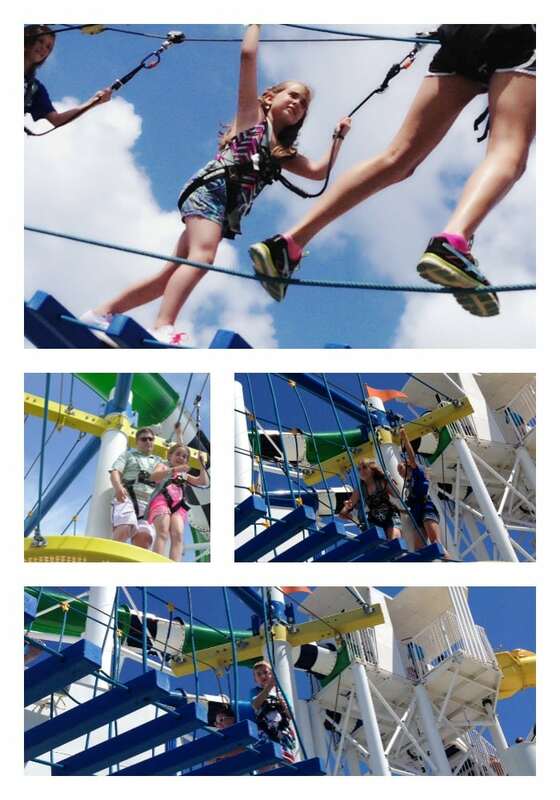 Ok, I know I said that the Sky Course was my favorite part of the cruise… but I’m second guessing that choice. 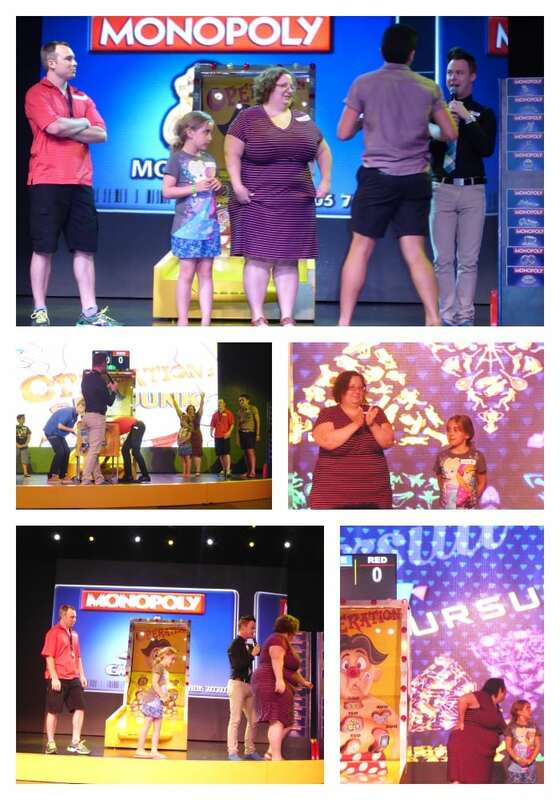 The Hasbro Game Show Night was pretty darn COOL. My daughter was picked to go on stage (and not because I was a blogger but because we were jumping up and down like maniacs in the crowd trying to answer questions right to get her on the stage). We cheered her on as she joined her team for the ‘Operation’ challenge. And they WON!! So cool! She was so SHY which is TOTALLY out of character for Natalie. But I can’t blame her. There must have been about 300 people in that room. SO SO SO SO SO SO SO SO SO SO SO SO FUN! This was an absolute highlight for us while onboard the Carnival Sunshine. Looking to play a little basketball? How about miniature golf? Pool? Table Tennis? Shuffle Board? Jogging? Foosball? I mean… Twister?! WHAT? What do you want to play? 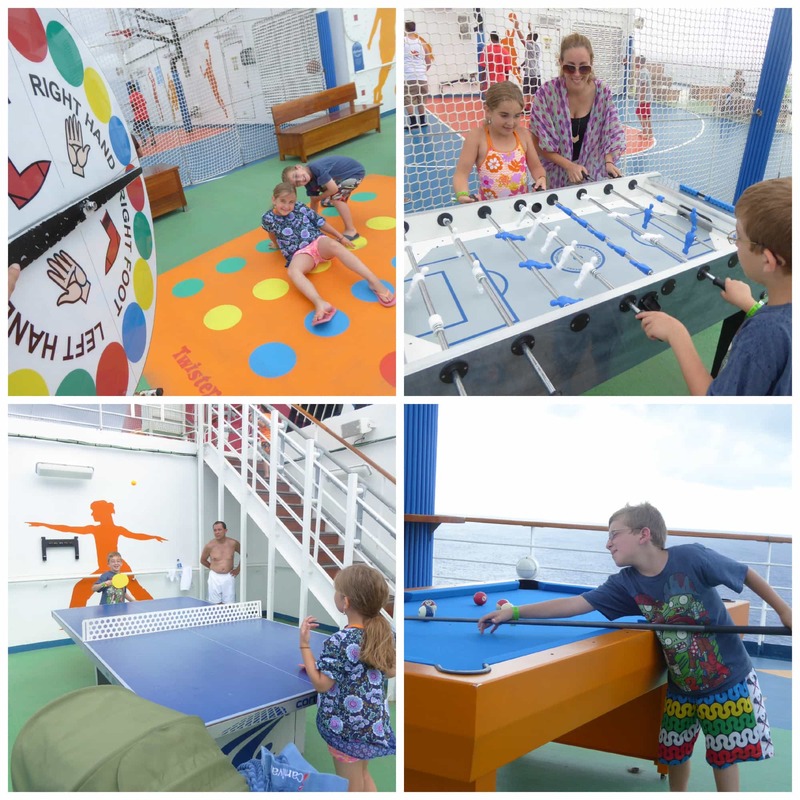 Because it’s there – all there on the Carnival Sunshine SportsSquare. Crazy. We just walked around and went from one game to the next. There was a slight wait but it wasn’t anything crazy. Most times the kids just joined in with other kids. Lots of fun! I only saw this once on the schedule – but I could be wrong! Check daily and be sure to go when it comes up because we had a blast. Heck – we even bought the BOOK once the class was over!! I told my kids that I expect a new animal on my bed every night before I go to bed. HA! It looks easier than it actually is – but I couldn’t resist it. Every day when we returned to our room, we had a little something special waiting for us. An elephant – a stingray – a monkey – ALL SO AMAZING. Like I said – my children have homework to do! Are you looking to book a family getaway for your little ones? Then check out Carnival and see what sail dates they have coming up. 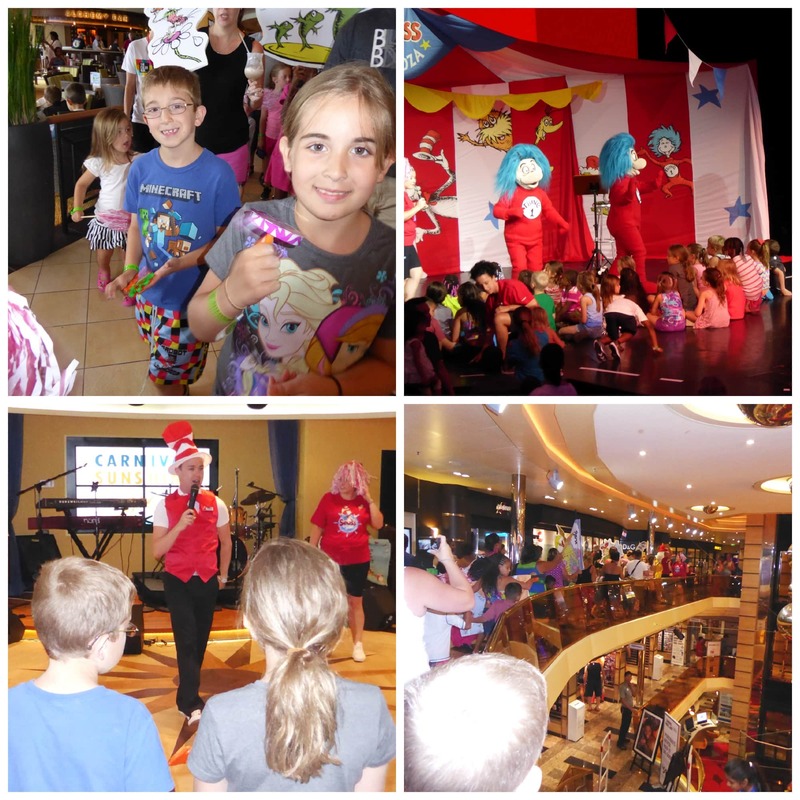 We were on the Carnival Sunshine, but I am sure that all of the boats have a little magic waiting for your kids while at sea. I have so much more to say about this Carnival Sunshine cruise including information about the ports we visited. Our cruise visited the Bahamas, Puerto Rico, St. Thomas and Grand Turk. Amazing PLACES! Look out for more posts about this trip over the next few days. What an incredible family experience! I have to be honest….I’m not sure how you fit it all in! What an extraordinary experience…. your kids (and you and Bill) look like you had an amazing time… and Carnival certainly knows how to make sure everyone is cared for and having the very best time. So love to know you all had so much fun. Their faces? Priceless. Looks like you had such a wonderful time and it’s clearly perfect for family travel! Aww looks like the whole family had a wonderful time. Love all the pictures. So much fun! 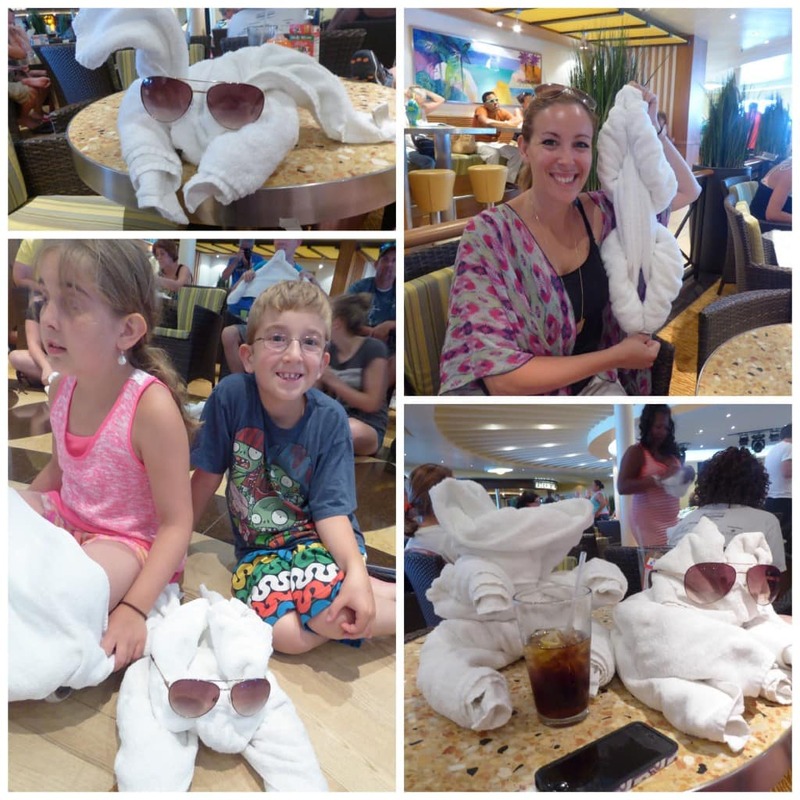 I totally agree that cruising with your children is a much different experience, but I’ve done both, and I truly enjoy both. It’s just a little less hectic without the children LOL!